I LOVE creating backgrounds with Brusho Crystals! I do get very messy hands (perhaps I get too carried away!) and I don't like to waste anything so I tend to make several at a time and keep them to one side until inspiration strikes! I have created Brusho backgrounds on watercolour paper, Whisper White cardstock and Thick Whisper White cardstock and loved all of the results. So I decided it was time to experiment with Glossy White cardstock ... and what joy it was! This little piece is actually what I call a "2nd generation" piece - where I've already created one background and then pressed some scraps into the leftover pools of colour. Typically I find I'm very happy with the 2nd generation, the 3rd generation is fine but often needs a bit of help but after that it's all a bit muddied up or washed out. The original background has very intense, strong colouring and this is much more delicate. I needed to heat emboss the image because I planned to colour with alcohol markers so I couldn't simply use the Basic Black Archival ink as I would normally on Glossy cardstock. Having wiped the card with my Embossing Buddy, I tapped the stamp onto the Versamark pad first then onto my Basic Black ink pad, stamped the image and added clear embossing powder before heating with the Heat Tool. 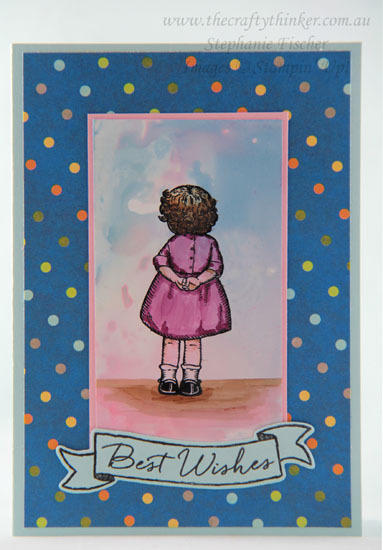 The greeting is from the Blooms & Wishes stamp set. It's photopolymer so it can be shaped to perfectly fit into the Banners For You banner which I then cut out with the coordinating Bunch of Banners framelit die.